KeyMander, the breakthrough gaming controller adapter from IOGEAR, brings the unmatched speed and precision of a keyboard and mouse to console gaming. Now you can use your keyboard and mouse skills to dominate all your favorite FPS (First Person Shooter), RPG (Role Playing Games) and RTS (Real Time Strategy) games. By connecting your keyboard and mouse to the KeyMander, all controller functions can be rapidly and more accurately accessed so you can easily destroy the competition. Spend your money on games and stop worrying about your PC's memory, video card or processor speed. With a game console and KeyMander you can now plug in your keyboard & mouse to enjoy the latest games without emptying your pockets on new PC parts. 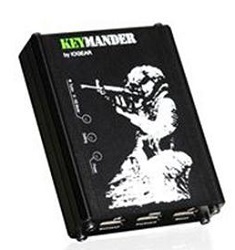 The KeyMander can be used on both Xbox One and Xbox 360 to play your favorite FPS, RPG or RTS games. Increase your precision and accuracy on FPS games such as Halo, Call of Duty and Battlefield. The KeyMander is the perfect accessory for the PS3 / PS4. PWN your competition in multiplayer games against players that are still using controllers. Playing the FPS, RPG and RTS games on the PlayStation has never been this much fun.